Why a Flowchart? Flowcharts are helpful in understanding a complicated process. This is especially true if you have to make decisions and do different steps depending on those decisions. 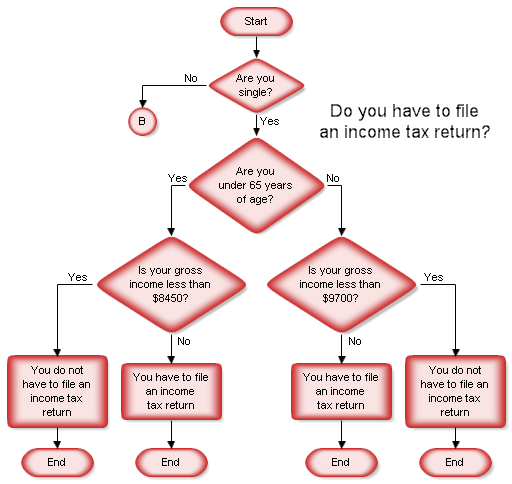 By looking at a flowchart you can visually follow different paths through the chart. 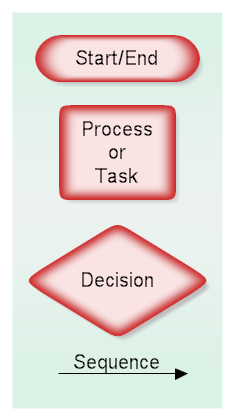 For each step on a flowchart you can ask yourself "Why is this done?" Free Trial Making a flowchart with RFFlow is very easy. First run RFFlow. If you don't have it, download the free trial version of RFFlow from this Web site. 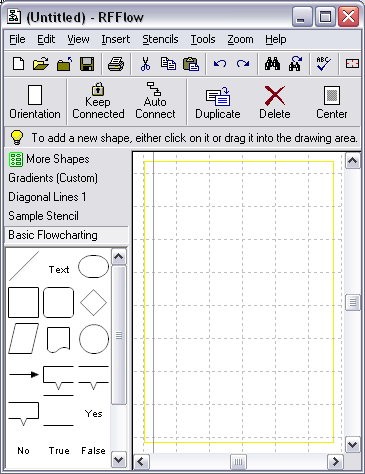 Basic Flowcharting Stencil In RFFlow click the More Shapes button. It is on the left above the stencils. 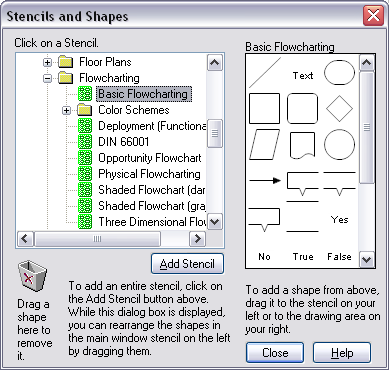 The Stencils and Shapes dialog box will appear as shown below. Scroll to the Flowcharting folder and click the plus sign to open it. Then click Basic Flowcharting and the Add Stencil button. The Basic Flowcharting stencil will now show up on the left of the RFFlow Window as shown below. Add Some Color If you want to make your flowchart more colorful, you can right-click on the name of the stencil Basic Flowcharting and click Choose a Color Scheme. I chose the top color scheme with a gradient-center fill and a shadow. Terminator All flowcharts start and end with the terminator or terminal shape. This is a rounded rectangle and is shown below. You use this same shape for both the start and the end. You will see some charts with slightly different terminal shapes. This is because there is no golden standard for flowcharting. Different companies and different technical areas use different shapes. There are a few basic rules and, beyond that, you can create your own rules for your organization. If you add your own shapes, it is important that you explain what they are for, so others can understand your chart. Just click on the terminator shape in the stencil and then type in the text. To read a flowchart, you follow the arrows from shape to shape. To draw a line in RFFlow, click on the line in the stencil at the left and then drag the mouse to draw the line in your chart. It is faster to place all your shapes first and then draw all the lines at once. Decision The decision shape asks a question. "Are you under 65 years of age?" 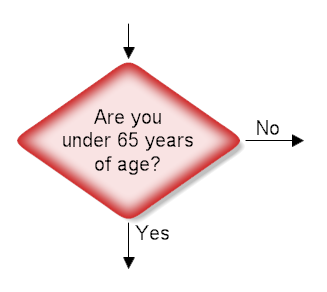 If you are less than 65 years old, you follow the arrow going down out of the decision shape. If you are 65 or older, you follow the arrow to the right. Process The rectangle is used for activities or action steps. These are things that must be done. Circle A circle containing a letter or number means that this chart connects to another chart on a different page. The same circle and number are then the entry point on the new page. It is best not to use these, but sometimes they are necessary. Title It is good to have a title on your chart. Just click on the word "Text" in the stencil and use a larger font size. Putting it all together The chart shown below could be part of the 2006 Federal Income Tax return instructions. You start at the top and follow the arrows from shape to shape. Flowcharts usually go from top to bottom or left to right, but you can do whatever you want. The circle with the letter B refers to a chart on a different page. You would find that page and look for a B in a circle. Almost all flowchart can be done with only these four shapes. Moving you chart into a document After drawing your chart, you can copy and paste the chart into Microsoft Word or any other Windows program. If you want to put the chart on the internet, you can save your chart as a PNG or HTML file. Level of Detail You or your group must decide the level of detail to use in drawing your chart. Usually it is best to start specifying only general steps and leaving the details for later. Whatever you do, the level of detail should be consistent throughout the chart. For example, if you are flowcharting editing a Microsoft Word document, you might have a rectangle with the words "Print Document." A detailed chart might split this rectangle into several rectangles that show each step of clicking on the Print button in Word, selecting the appropriate printer, etc. Make sure you are not wasting time by specifying at too detailed a level. With RFFlow you can make hyperlinks in shapes so that when you click on the shape, you jump to another chart that has the details for that shape. You can also save RFFlow charts as HTML and have links to other Web pages. Other Charts To see samples of other charts and other kinds of flowcharts that can be drawn with RFFlow, see our Samples Web page. What do the flowchart shapes mean?